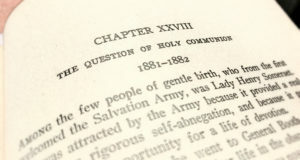 The Salvation Army holds to a unique position in the Church. Like the Gentile Church who chose not to be circumcised, The Salvation Army carefully came to the conclusion that it was important to fully embrace the spirit of sacramental living without the form we traditionally associate with it. Here you will find foundational writings which led to this unique position.